Nine years ago, Seattle’s sports scene was in about as dire circumstances as a city can get. The owner of the SuperSonics, Starbucks mogul Howard Schultz, had thrown a hissy fit over Washington’s refusal to gift him $220 million to renovate an arena that had just been renovated 11 years earlier, and sold the team to Oklahoma City hedge fund mogul Clay Bennett, who relocated them to Oklahoma City to become the Thunder. Then-NBA commissioner David Stern had declared, “If the team moves, there’s not going to be another team there, not in any conceivable future plan that I could envision.” It seemed like either Seattle fans were going to be bereft of basketball for the foreseeable future, or Seattle taxpayers were going to have to cough up big-time for a replacement team—just as Cleveland had for the new Browns, and Houston had for the Texans, and on and on in recent sports history. Today, while much remains uncertain about Seattle’s hoops future—more about that in a minute—things are looking somewhat brighter on the getting-ripped-off-by-sports-barons front. In coming weeks, the city council is set to decide between two plans for new or refurbished arenas, both of which would involve some public money, but in either case far, far less than the 75 percent that is typical of modern sports facility deals. Whatever happens, Seattle is not going to get royally hosed, and as things go these days, that’s a not insignificant accomplishment. Whether you’re a sports fan forever holding in the back of your mind that your team owner could threaten one day to up and leave, or a taxpayer worried about being forced to cough up tax money for some rich dude’s new playpen—or, as is likely, both—you’re probably asking: What did Seattle do, and how can my city get some of that backbone? The answer: a combination of luck, citizen activism, and understanding the leverage that a city has against team owner blackmail. It’s not necessarily easily replicable, and not an unmitigated victory—Seattle will still likely be on the hook for some public cash, and a replacement NBA team still isn’t guaranteed—but it wouldn’t hurt for other towns’ citizens and elected officials to read up on the Seattle arena saga, as part aspirational model, part cautionary tale. By the time of the Sonics’ departure, Seattle had been battling for more than a decade over the use of public money for private sports stadiums. Way back in 1995, when the Mariners were in the midst of an end run around a public vote against stadium subsidies (the team appealed directly to the state legislature, and ultimately won $384 million in tax money for what became Safeco Field), three local residents, Chris Van Dyk, Nick Licata, and Mark Baerwaldt, founded the memorably-named Citizens For More Important Things. During the brief interregnum after Bennett bought the Sonics but before he consummated the move to Oklahoma—insisting publicly all the while that he still wanted to pursue a new arena in the Seattle area, even while privately emailing his fellow owners of a move that “I am a man possessed! 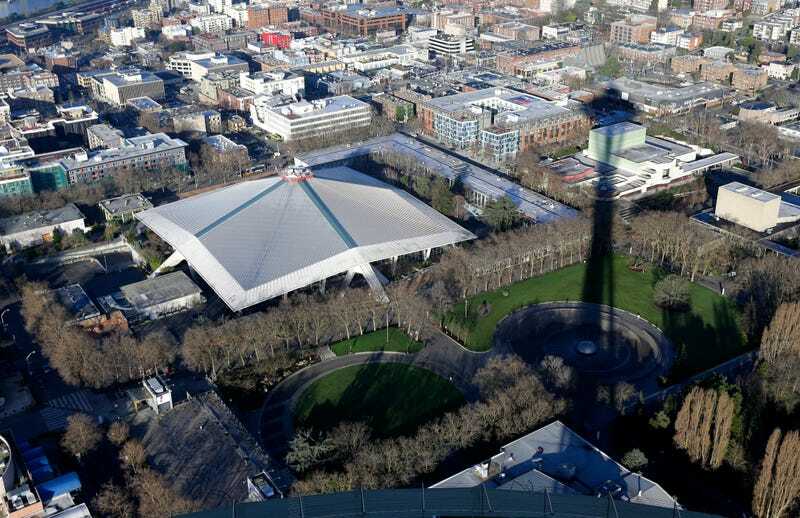 Will do everything we can” to relocate the team—the new group used Seattle’s robust public initiative process to launch a preemptive strike against any arena funding demands. But rather than, say, requiring a public vote on any sports venue funding, as other cities had done, Initiative 91 had a simpler requirement: Any sports spending by the city would have to generate a positive return on investment greater than the city would earn on U.S. treasury bonds. Hansen was Chris Hansen, a Seattle-raised hedge fund manager who soon set out to prove that he could bring back the NBA within the strictures of I-91. Hansen proposed building a new arena near the Mariners’ and Seahawks’ stadiums in the city’s South of Downtown (Sodo) neighborhood, using a combination of private borrowing and public bonds that would be repaid with an intricate assortment of rent, ticket taxes, and kicked-back business, property, and sales taxes on the arena. On the surface, this was a common public funding dodge: “Incremental tax revenues” are generally pooh-poohed by economists as a subsidy by other means, since all evidence shows that entertainment spending in one part of a metropolitan area just ends up being cannibalized from somewhere else. Still, the dollar figures were low enough that if Hansen’s plan didn’t create a treasury-bond-level ROI (as it turned out, I-91 had some loopholes as written), it would at least be better than a kick in the head: My own back-of-the-envelope analysis at the time showed that Hansen’s arena would at least be close to break-even for the city, assuming that at least some neo-Sonics fans were encouraged to spend their money within city limits rather than out in the suburbs. The council approved the Sodo arena plan in September 2012. (Licata was one of two councilmembers voting no.) And then everyone waited for Hansen to land an NBA team, which he insisted was a precondition of building the arena. He came close. The Maloof brothers almost moved the Sacramento Kings to Seattle in 2013 amid their own arena battle, and only a last-minute fold by the Sacramento city council and the arrival of tech mogul Vivek Ranadivé to buy the Kings put the kibosh on that. (Hockey might have been an easier get for Hansen, and will still presumably follow the return of the NBA before long, but by all accounts his main motivation was sating his sports jones, and his game was hoops.) The Sodo plan trundled along, though, right up until May 2016, when the Seattle council unexpectedly voted down a small but key piece of legislation, denying Hansen the right to close a one-block stretch of a public street that he needed to make way for his arena. Arena backers griped, with some reason, that council had only rejected the street closure at the behest of unions representing workers at the Port of Seattle, who had long opposed anybody building an arena on their damn lawn. (Some also griped, far less reasonably, that the councilmembers who voted down the street vacation would never have done so if they’d been in possession of penises, and presumably done their thinking with them.) But the deed was done, and the Sodo arena was back to square one. At this point, attention began to turn back to the old arena that Schultz had been seeking to get taxpayers to renovate before he sold out to Bennett. KeyArena (originally the Seattle Center Coliseum before a bank naming-rights deal) had been built in 1962 and received a $95 million renovation in 1995; now the council announced that it would open up to private bidders the chance to rehab the building again, so long as no public money was involved. Incredibly, it did work—sort of. Two competing companies, AEG (controlled by Philip Anschutz, owner of the Los Angeles Lakers and Kings, as well as the Staples Center) and Oak View Group (run by Anschutz’s estranged former lieutenant Tim Leiweke, in partnership with Madison Square Garden’s arena-management arm), put forward a pair of convoluted financing plans that didn’t quite meet the city’s no-public-money pledge, each demanding kickbacks of “incremental” taxes à la Hansen (Oak View asked for about $40 million worth of tax money; AEG, which eventually dropped out, sought closer to $100 million), with Oak View additionally asking for $50 million in federal historic preservation tax credits. The actual tax benefits to Seattle that were supposed to repay these costs were, as usual, murky; a study by University of Washington public policy professor Justin Marlowe reported Hansen’s plan would generate $103 million in new taxes compared to just $34 million for a Key redo, only to have its author himself note that tweaking a couple of assumptions could make for very different results. On the other hand, there are still plenty of counterexamples that stadium grifting is alive and well, from Mark Davis extracting an incredible $750 million from the state of Nevada for a Las Vegas Raiders stadium at a time when his only other option was to go play in the street, to Cleveland Cavaliers owner Dan Gilbert successfully finagling $70 million for a renovation of his arena by having the county buy off opponents with a couple of new mental health crisis centers. If there’s an overarching theme here about the power of the citizenry to sway sports subsidy deals, it’s probably “it depends”—on local regulations, on voter initiatives, which are stronger on the West Coast (when New York City tried to hold a referendum on a new Yankees stadium in 1998, then-Mayor Rudy Giuliani was able to knock it off the ballot simply by proposing his own unrelated ballot measure instead); and on the power of local “growth coalitions” of business and political leaders, which as researchers Kevin Delaney and Rick Eckstein detailed in their book Public Dollars, Private Stadiums, has a huge impact on the outcome of stadium demands (Davis’s money grab in Nevada was successful in large part because he enlisted local casino mogul Sheldon Adelson in his cause, even if he ultimately double-crossed Adelson). For concerned citizens seeking ways to avoid being extorted by team owners, this unfortunately means that there’s no single playbook for opposition. Sometimes referendums will be available, sometimes they won’t; sometimes there’s a laborious public process during which to pressure elected officials, sometimes a deal will be swept through behind closed doors; sometimes there’s a local requirement that a stadium-related tax hike go before a public vote, sometimes the state legislature will rewrite the law to let a team owner evade it. Ultimately, fighting sports subsidies city by city is a crapshoot—the best solution remains national action, along the lines of the bill proposed by U.S. representative David Minge two decades ago, which would have imposed a federal income tax on corporate subsidies, making companies less eager to extract them from cities. But in a world where it’s probably not best to wait on the federal government to ride to the rescue to solve social ills, sometimes the best ideas really can bubble up from the grassroots. Seattle’s arena denouement won’t be the revolution, but if it helps encourage more cities to demand that team owners give and not just take, it’s a step in the right direction.